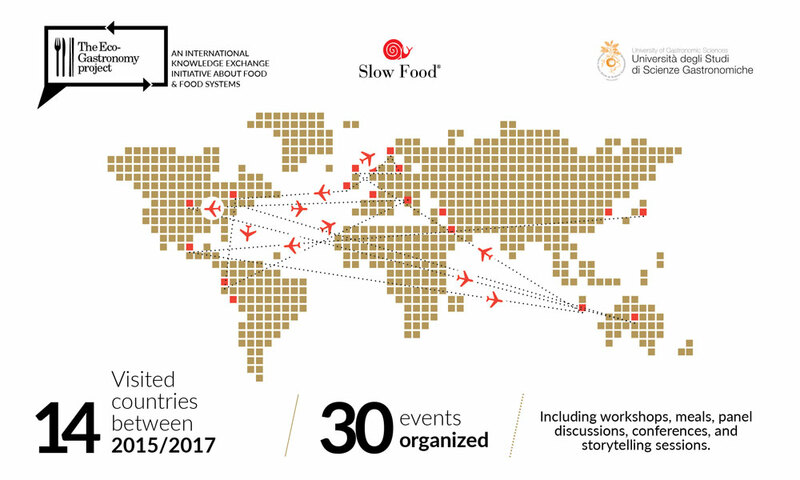 In November 2015, the University of Gastronomic Sciences launched a multi-year initiative to create an international knowledge exchange about food and food systems. Coordinated by Dr. David Szanto, the Eco-Gastronomy Project visited 14 different countries around the planet. More than 30 events were organized, including workshops, meals, panel discussions, conferences, and storytelling sessions. Locations included: Seoul, Mexico City, Singapore, Dili (Timor-Leste), Edinburgh, Wrocław, Oslo and Ås, Copenhagen, Dublin, Toronto, Quito, Torino, Minneapolis/St. Paul, Portand (OR), Melbourne, and Montréal. At each stop, David and local partners drew inspiration from an ecological-philosophical vision of food—the thinking-feeling-doing of gastronomy. An archive of the events, including reports, videos, and images is available here. Eco-gastronomy is a concept that views food systems through an ecological-philosophical perspective. It is an approach that merges the ‘thinking-doing’ of food (gastronomy) with an acknowledgement that when we think and do things with food, many different effects are produced. Sometimes these effects happen in real time, and sometimes later; sometimes they happen close to home, and sometimes further away. Importantly, eco-gastronomy recognizes that food and food systems are made up of material elements, language and representation, and interactive processes. This means that any interaction with food can produce political transformations, environmental and social change, shifts in symbolic and conceptual meaning, as well combinations of all of these. Eco-gastronomy is not limited to industry, or agriculture, or academia—it encompasses all food realms. It indelibly links food and humans, while bringing attention to the responsibility that all people have for the health and well-being of our food ways—producers, activists, cooks, academics, artists, politicians, and industrialists alike. The University of Gastronomic Sciences was founded in Italy in 2004 by Slow Food International. It offers undergraduate and graduate programs involving multi-experiential learning in classrooms, workshops, and in the field. The university’s aim is to build academic credibility for gastronomy while acknowledging that learning about food takes place through the mind and body, the heart and gut, as well as through all of our senses. To date, nearly 2000 students from 70 countries have attended. Dr. David Szanto was one of the first English-language master students at UNISG in 2005, going on to work for the school in communications and outreach, as an instructor and program director, and now as UNISG’s professor-at-large. In 2015, he earned a PhD in gastronomy from Concordia University in Montreal (Canada), the first of its kind.